XnView Pocket is an easy image viewer/manager/convert. You can easily visualize your images and photos on your Pocket PC with XnView Pocket. Thanks to these many tools of final improvement you can correct your photos, share them with your friends and your family by sending them by e-mail. 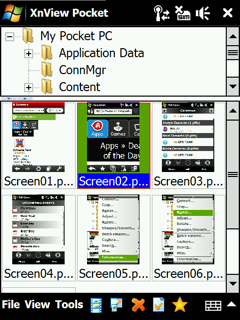 XnView Pocket makes it possible to you to realize slide shows particularly with the executable format readable by all. You can edit IPTC metadata, send or receive picture by Irda. Reading: Jpeg / Jfif, Gif, Bmp, Png, 2bp, Tif, Pcx, Pbm, Pgm, Ppm, Pnm, Psd, Tga. Writing: Jpeg, Gif, Bmp and Png. - Display in 5 input modes: Thumbnail, list, detail, Filmstrip et full screen. - Use of the favourites to simplify and accelerate the navigation through files. - Display informations, exifs and iptc of images. - Sorting of images by the name, the date, the type, the size and the definition, the whole in ascending or decreasing order. - Conversion of images between the different supported formats. - Resizing of images according to various factors, sizes, and possibility to resize to the screen size in order to obtain the best ratio weight/clearness. - Association of image types with XnView Pocket possible and modifiable. - Slide Show mode with adjustment of time between the slides, of the background color. The transition effects are also usable in this mode, the display in landscape mode (allowing the display of the images while turning the Pocket PC of 90°, becoming into the screen proportions in adequacy with the proportions. - Sending of the images by email with change of size and format possible. Displaying in 5 modes : Thumbnail, list, detail, filmstrip et full screen. Displaying images in different formats : jpeg / jfif, gif, bmp, png, 2bp, tif, pcx, pbm, pgm, ppm, pnm, xbm, xpm, tga, ico. Writing images in jpeg, gif, bmp, tga and png formats. Using multiple factors of zoom, or automatic adaptation of the images size to the screen size. Using the favorites to simplify and accelerate the navigation through files. Displaying informations, exifs and iptc images. Correct and Retouch your photos using the many tools of XnView Pocket. Crop directly with the stylus. Brightness, contrast, gamma and RGB adjustment. Rotation of the images in all directions, and JPEG lossless rotation. XnView Pocket allows you to classify simply and effectively your images and photos. Images sorting on the name, the date, the type, the size and the definition, the whole in ascending or decreasing order. Images conversion between different supported formats. Images resizing according to different factors, sizes, and possibility to resizing to the screen size in order to obtain the best ratio weight/clearness. Simple or multiple images selection, as in a PC software. Association of images types possible and modifiable with XnView Pocket . XnView Pocket also has a slide show mode with adjustment of time between the slides, of the background color. Slide Show creation in exe format, archievable in an autonomous way (if for example you give your Slide Show to a user who don't have XnView Pocket). Images sending by email with change of size and format possible.